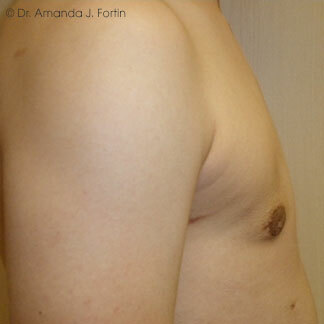 Varying degrees of male breast development is seen. 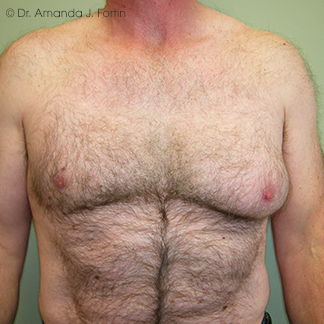 The surgery for gynecomastia therefore varies from needing only liposuction, to a full breast reduction or mastectomy. The amount of scarring will be proportional to the amount of breast tissue and the elasticity of the skin. 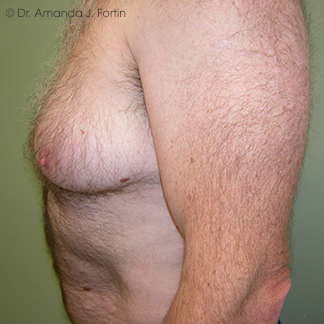 Adolescent gynecomastia correction (due to hormones) is often covered by OHIP, however senile male breast development as a result of weight gain/loss is not. The main risks of this procedure include bleeding, hematoma (a blood collection), seroma (a fluid collection), infection, healing problems and asymmetry. Scars are expected. After surgery it is important to limit activities to avoid a hematoma or bleeding afterwards, and to wear a compression garment to minimize swelling. Recovery should be expected between 2-4 weeks. Treated with direct excision. (click for details & to enlarge). 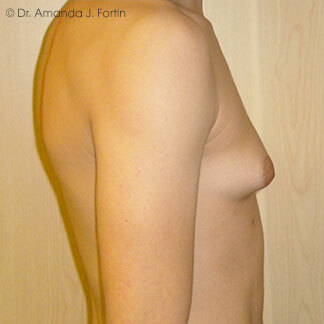 Post op photo 1 month after liposuction (500cc) and direct excision (40g). Post op photo 6 months after direct excision. 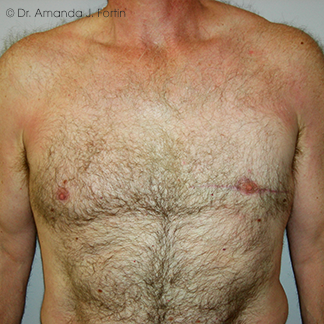 Note the longer scar on the Left required for excision of volume and excess skin. 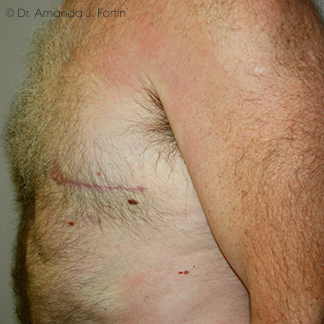 Patient – 58 year old man following massive weight loss. 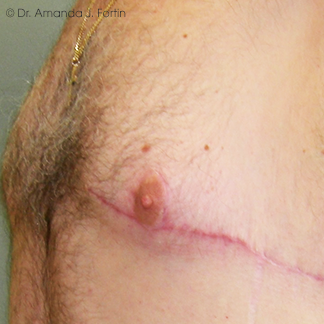 Post op view at 6 months following direct excision of excess skin and tissue.